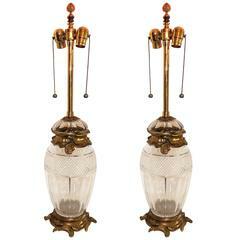 French Louis XVI Style, pair of gilt bronze and cut-crystal girandole lamps Elegant and decorative pair of gilt bronze girandole candelabra lamps. 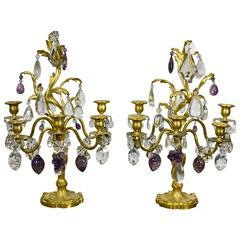 Fine quality cut crystal decoration with white crystal faceted plaques and white cut-crystal dagger top. 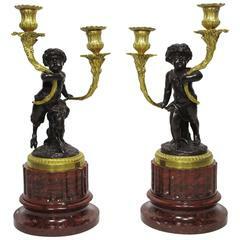 French Louis XVI style work, early-20th century. 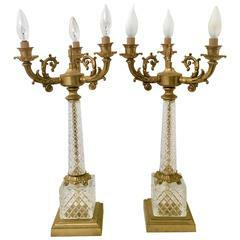 Dimensions: H 18.50 in., W 11.02 in., D 5.11 in. In fine original condition. It professionally wired for electricity. 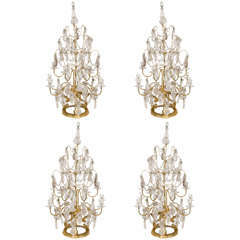 In fine original condition. It professionally wired for electricity. 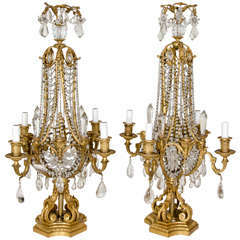 Pair of superb large Antique French Louis XVI style gilt bronze & cut crystal candelabra lamps embellished with crystal chains & cut crystal prisms.